You can squat to questionable depth, and perhaps still give yourself the lift. You can bounce a bar off your chest and kid yourself that that bench press counted. But if you can’t get the bar off the floor, it’s no deadlift. One of the reasons many lifters either love or loathe the deadlift is that it is such a raw test of physical and mental strength. There are no grey areas. Either the bar leaves the floor, or it doesn’t. The bar should be in the middle of the foot. As with every big lift, the set up is crucial. The deadlift is no exception. To achieve your biggest deadlift, the bar must stay close to the body, and the bar should travel the shortest distance possible. This means that any deviation of the bar from the centre line will result in less weight lifted. To achieve this, the barbell should go through the centre of the foot on set up. The mistake most people make is that they put the bar in the middle of the forefoot, rather than the middle of the whole foot. It should bisect the arches of the feet. When set up properly, your shins will be very close to the bar, perhaps only an inch or two away before you bend to grab it. The stronger your grip, the stronger you will be. Your nervous system won’t recruit the maximum amount of muscle mass if you are unsure of your grip. Your brain knows that if you can’t hold onto a weight, you probably shouldn’t be trying to raise it into the air. That means, if you don’t feel locked onto the bar, it’s going to be impossible to lift. A quick way to assess if your grip might be the limiting factor for your deadlift is to use lifting straps. Try using straps on a weight you’ve previously failed to lift. If it goes up easy, you know that it wasn’t your total strength that was lacking; it was your grip. One weak link in the chain will halt progress, and that link is often grip. Anyone who has lifted for many years will tell you that improving your deadlift probably won’t improve your squat. But if you improve your squat, it will improve your deadlift. If you focus on building a massive squat, you’ll be more likely to move some impressive numbers in the other major lifts. 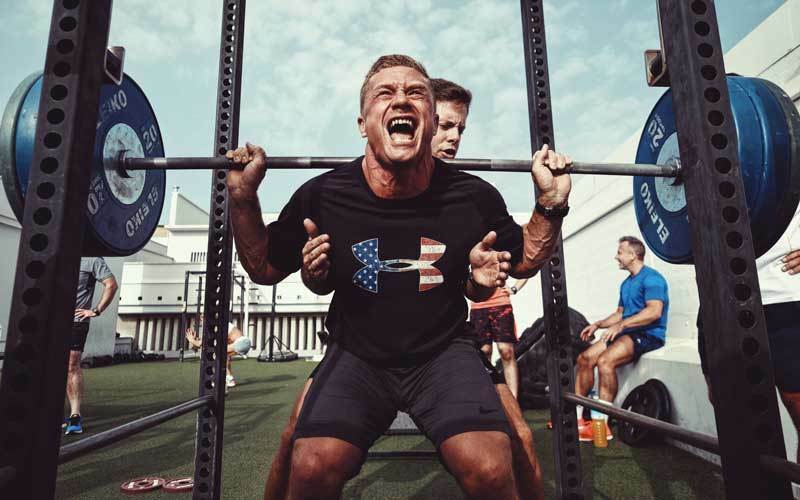 The squat requires so much raw strength and stability through every major joint that it impacts heavily on your performance of the other lifts. Squatting big will strengthen the upper and lower back, glutes and hamstrings. To have a big squat you need to be solid and stable through your entire body, and this raw strength translates to the deadlift. Try it. Add 20kg to your squat and your deadlift will more than likely improve, even without deadlifting. 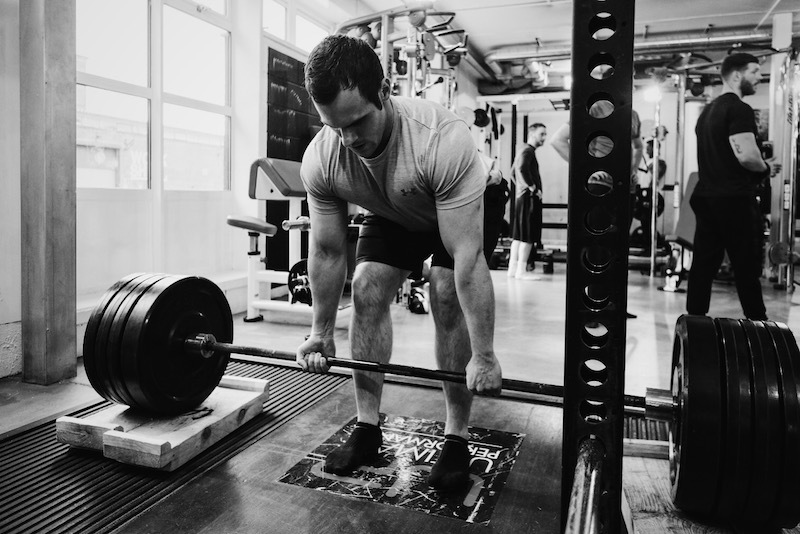 Though a deadlift should never have a ‘hitch’ up the thighs, you must keep the bar as close to you as possible. This means keeping constant contact with your legs throughout the movement - the odd shin scrape from the bar is going to happen if you’re keeping the bar close enough to your body. The increase in the forces placed on the lower back is huge if the bar drifts slightly forward away from that contact with the body. With maximal weights, such as a one rep max, this will cause you to miss your lift. If going for reps, it will cause your back to round and undue stress to be placed on the spine. 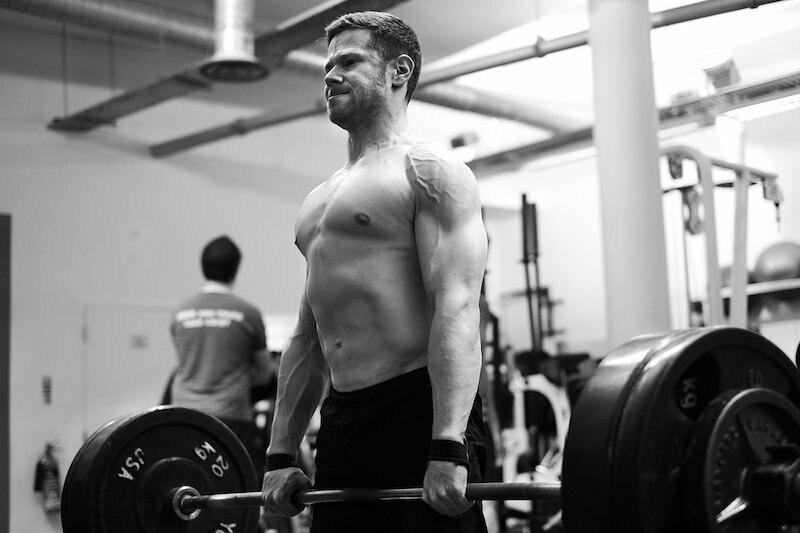 The deadlift should get easier at the top, with its hardest point being when the weight is just leaving the ground. To help bust plateaus in strength, attaching chains to the bar will help. The use of chains will mean that the bar is lighter at the start of the movement (the weight of the chains hangs down onto the floor). The weight will get increasingly heavier as the bar is lifted and the chains rise into the air. This is known as 'accommodating resistance'. If you are using chains for a deadlift, these should be different from chains used for a squat. Because a squat is a much longer movement; the bar is much higher off the ground; the chains can afford to be longer and less bunched up. For a deadlift, your chains will need to be much shorter. You’ll most often see big bunches of chains used for deadlifting for this reason. Though your squat will benefit from more frequency, that isn’t true for the deadlift. Finding the right frequency for different lifts is the key to fast progress. This will vary from person to person - so experiment. Some may make great progress with up to 10 days between deadlift workouts, while others might do better on five days. On average though, you’ll be deadlifting less often than your other major lifts. To assess, try leaving four or five days between workouts and next time you lift, pay attention to how fresh you feel and how well the weight is moving. Have you increased weight? Do you feel stronger with tighter form? Is the bar going up faster? If not, leave it six days next time and repeat as needed. You’ll know you’ve hit the right spot because the same weights will start flying up. It’s very noticeable when you’ve had the right amount of recovery between deadlifting. Take those running shoes off. If you’re lifting with soft-soled trainers, you’ll add a lot of weight to your deadlift just by removing them – go barefoot. This is for three reasons. The first is that you’ll literally have less distance to move the weight. Some trainers could be adding two or three centimetres of height that you now need to move the weight over. It might not sound like much, but it can make a big difference. The second reason removing your trainers will help your lift, is they absorb some of your force. If the soles of your trainers are soft because they are designed to absorb the forces of running or similar activities, then they will also be absorbing some of the drive for your deadlift. When you try and jump in the air while standing in deep sand, you’ll not jump as high - the soft surface under foot reduces your power. The same thing happens with running trainers and lifting. The third reason is stability. If your weight shifts to one area of the foot more than another during your lift, the soft sole of the shoe will collapse in that area, leaving you off balance. If you’ve got an unstable base, you’ll lift less weight. Because of these three reasons, you’ll generally see the best deadlifters in the world going barefoot or wearing trainers with very low, flat soles. Many novice lifters make this mistake. They know you should ‘keep your back straight’ and have probably been told to ‘lift with your legs’ in some mandatory health and safety video at work. They try to stay as upright as possible and squat down to the bar, with most of the bend coming from the knees instead of the hips. However, a deadlift should never be a squat. The more you bend your knees, the further forward the bar travel move to get around the knees. As a result, the bar path drifts away from centre line, placing more strain on the lower back. Keeping the hips back with a smaller knee bend will place less strain on the lower back. It’s tempting to give the bar that slight bounce when going for reps on the deadlift, however, you’ll get more long-term benefits from putting the weight down and resetting your position. Not only does this help you practice your set up, it eliminates weaknesses from the floor. If you bounce the weight when going for reps, you’ll limit your deadlift significantly. Resetting on the floor each time will also let you practice getting tight through your entire body, and pulling the ‘slack’ from the bar before lifting. 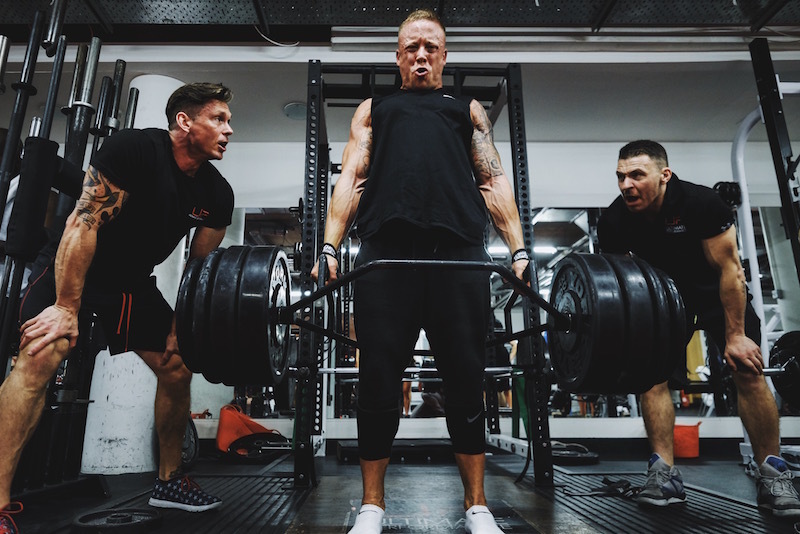 The deadlift is one of the few lifts that you start completely stationary, so you better get damn good at overcoming that inertia if you want to move big weight. You need to practice your deadlifting to build optimal technique. The tips here that will mean nothing if you don’t practice. As the saying goes, practice doesn’t make perfect – perfect practice makes perfect. Are you really going to have perfect technique performing extremely heavy reps? Every lift above 70% of your one-rep max is going to increase strength. That means if you can deadlift 140kg for one rep, performing reps with 98kg and above will still build more strength. The benefit is that the reps using lower weight are going to look a lot better, and you’ll be drilling your perfect technique. Normally, if you’re lifting at 70% of your max, you’d perform significantly higher reps. However, you’ll find your deadlift fatigues when performing high reps, even with lighter weights. Because of this, you’re better off performing low reps with the lighter weight. You stop well before any failure of good technique. Then take shorter rests than normal. For example, performing six sets of three reps with 70-80% of your maximum but with only one minute in between sets. We’ve all looked at someone else doing deadlifts that are ugly as sin and just cringed. Our deadlifts would never look like that, right? Don’t be so sure. If you want to change something, you must measure it. You should be tracking the sets, reps and weight lifted for your workout, but recording the reps doesn’t record what those reps looked like. If you want to improve your deadlift, that isn’t just about improving the weight moved; it’s about making it a better lift. The better your technique, the more weight you will ultimately be able to get off the ground. Filming your lifts will allow you to track the progression of your technique. The other advantage of filming your lifts is that it will help you identify the areas you need to work on. Is the lift slower or more of a struggle at the beginning, middle or end? Which part of your form is collapsing and needs further work? When filming, make sure you film at a perpendicular angle to your lift. If you film at a 45-degree angle or have the camera too high or too low, it’s very difficult to assess what might be going wrong. This is because the wonky camera angle makes everything look wonky. The deadlift requires a lot of intra-abdominal pressure and stability. Before you lift, take a big breath in as if you’re trying to fill your belly with air. Now ‘lock’ the abdominals tight against this air. This is going to increase the pressure in the trunk, keeping you tighter during your lift. Don’t let that air out until you’ve fully locked the shoulders back at the top. To demonstrate the importance of breathing, try this: breathe out as forcefully as you can until your lungs are empty. Did your shoulder collapse forward? Probably. The opposite happens when you breathe in. The shoulders pull back, the chest expands, and the head comes up. Perfect deadlifting posture. So breathe in, big chest, and hold it. 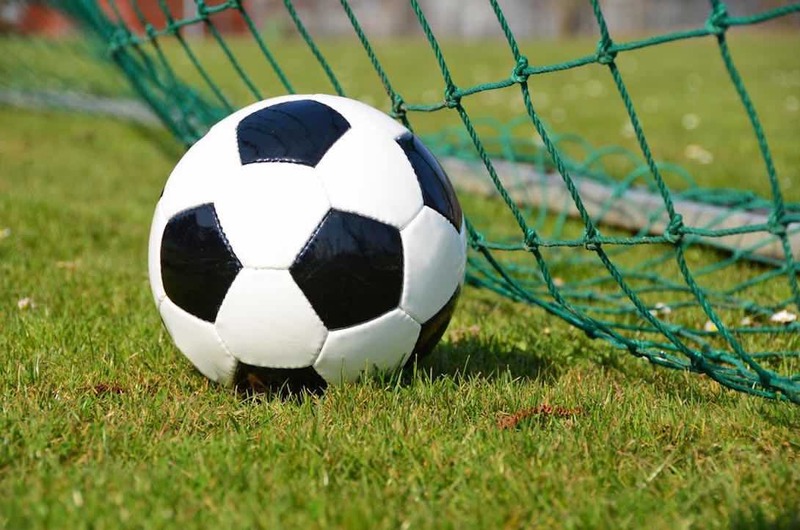 Strength Training For Football: Improve a Zidane!